For over five decades the main route for the extraction of titanium has been the Kroll process. It is regarded as being expensive, labour intensive, reliant on a high quality feedstock, and environmentally unfriendly, but it has thus far not been possible to replace it. As a result the usage of titanium is still restricted to a few high end applications. During the past twenty years several new molten salt based electrochemical approaches for the reduction of titanium oxide have been introduced to meet these challenges, and these may, eventually, lead to novel extraction processes for titanium and other reactive metals. This paper summarises the many interesting concepts that underlie these electrochemical methods, of which some have already advanced to the stage of substantial pilot plants whilst others are still being developed at the laboratory level. The paper also reviews the development of new materials for use as the anode in these processes. Finally, it touches upon the development of processes for the regeneration of oxidised titanium and for the welding of titanium under cathodic protection in cases where protective gas shielding is not possible. 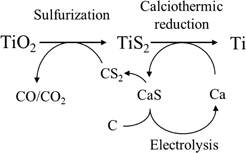 We have investigated the details of the calciothermic reduction of TiO2 in CaCl2-CaO-Ca molten salt electrolyte and developed a process for Ti production that is proceeding toward commercialization. In this process, when a potential of 3 V is applied between the carbon anode and the stainless steel cathode, the electrolytic decomposition of CaO occurs such that Ca deposits at the cathode and immediately dissolves into the molten salt. This Ca attacks the TiO2 powders fed into the bath and reduce them to metallic titanium. The engineering aspects of the new reactor have been considered according to the following items; (1) the simplest possible cell structure, (2) permanent inside wall lining, (3) open cell and (4) surface protection layer. The 10 days campaign using a reactor with 2 tons of molten salt and current of 4000 A has been conducted. As a result of the test, we came to propose a definitive model of open reactor body. We have theoretically examined the possibility of prebaked soluble titanium dioxide anode. Application of the oxygen-ion deficient titanium dioxide anode to this process will contribute to achieving the high productivity of titanium as well as the commercial level of oxygen in titanium. Titanium sponge is industrially produced by the Kroll process. OTC has been manufacturing titanium sponge using the Kroll process since 1952 and now has the capacity to produce 40,000 ton of titanium sponge a year. Titanium sponge made by the Kroll process is widely used, but that used for aircraft parts is ranked Premium Quality (PQ) grade and only a few producers, including OTC, can make it because of the high reliability required. Demand for PQ grade titanium sponge is increasing, so cost reductions within the Kroll process are needed. OTC has reduced costs by using middle-to-low-grade raw materials, producing the world&apos;s largest sponge cake, and improving productivity. Low current efficiency of the FFC Cambridge process made it no obvious advantages in cost compared with the traditional process to produce metals. Effect of the changed electrolysis cell on the current efficiency has been studied. Put the cathode into an alumina tube with a hole can efficiently avoid short circuit and the cathode contaminated by carbon produced from graphite anode. The results show that the current efficiency can be improved greatly by reducing the electric field intensity in the electrolysis cell. The high background current is mainly caused by the electronic conductivity in the electrolysis cell. Otherwise, pollution of the cathode is avoided, the depletion of the anode sharply decreases and the deoxidation of the samples greatly improve when using the improvement electrolysis cell. A ternary titanium alloy (Ti-13Zr-13Nb (TZN)) was prepared by direct electrochemical reduction of a sintered TiO2-ZrO2-Nb2O5 mixture in molten CaCl2 at 850℃ with an energy consumption of 17 kWh/kg-alloy. The electrolytic Ti alloy was well sintered with bright metallic luster, and it was in α+β dual phase and of porous structure with designed composition. The corrosion behaviors of the obtained TZN in Ringer&apos;s solution were tested by open circuit potential and potentiodynamic polarization measurements. The results show that the corrosion rate of the porous electrolytic TZN alloy is lower than that of commercial pure titanium (CP-Ti) after being immersed in Ringer&apos;s solution for 10 days. The one-step electro-reduction of mixed oxide powers in molten salts could be an energy efficient and straightforward way to prepare porous implantable alloys. Molten salt electroreduction process provides a simple approach for the facile production of alloys and composites. In this work, the solid oxide membrane (SOM)-assisted molten salt electroreduction process has been used to produce titanium alloys/composites directly from complex titanium compounds ores. The Ti-bearing blast-furnace slag, high titanium slag and natural ilmenite were used as raw materials. The SOM-assisted electroreduction process was carried out in molten calcium chloride (CaCl2) at 950–1000℃ and 3.8 V. The reaction mechanisms of the electroreduction process including the compounding process, the electroreduction process and the impurity-removal process were discussed. The results indicate that Ti5Si3, Ti5Si3/TiC, Ti5Si3/Ti3SiC2, Fe/TiC and TiAl3 alloys/composites can be directly electrosynthesized from different titanium compounds ores. CaTiO3 and Ca12Al14O33 compounds will be commonly generated as intermediate products during the electroreduction process in molten CaCl2. Impurities elements such as Ca and Mg can be removed during the electroreduction process. In addition, it is suggested that element Fe will be firstly generated during electroreduction process and thus can further improve the electronic conductivity of the ilmenite compounds pellets, Fe/TiC composites can be facilely produced from natural ilmenite. Electrochemical decomposition of CaTiO3 at the cathode was examined in a scheme of titanium metal production from natural deposit, Ilmenite (TiFeO3). Based on the possible precipitation of CaTiO3 from TiFeO3, the electrochemical decomposition of CaTiO3 is here examined using combination of the calciothermic reduction and the electrolysis of CaO in the same molten salt. Inhomogeneous reduction in the cathodic basket is related with buoyancy of Ca and insufficient dehydration. By optimizing the cooling conditions, CaO content in the molten salt, and dehydration method, an industrial level of 0.42 mass%O could be achieved as powder form. The solubility of calcium titanate in CaCl2 melt was investigated above 1373 K, and electrodeposition of Ti metal in the melt was attempted. 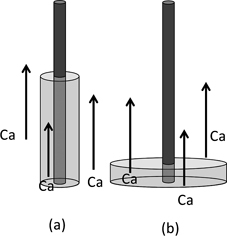 Many pits were formed on the surface of sintered CaTiO3 compact by the immersion in CaCl2 melt above 1373 K. The weight of the compact decreased with the increase in the immersion time, and the decrease got faster with the increase in temperature. Cathodic current in cyclic voltammetry increased with the addition of CaTiO3 powder in the bath, and the increase in the cathodic currents depended on the bath temperature and the added amount of CaTiO3. From the results by the electrochemical measurement, the solubilities of CaTiO3 in CaCl2 melt were estimated about 7 mol% at 1573 K, and less than 1 mol% at 1373 K. Metallic Ti was detected by XRD analysis in the electrodeposit obtained by potentio-static electrolysis in the bath containing CaTiO3 above 1373 K, but the amount of Ti metal seemed a little. The similar results were obtained in CaCl2 melt containing Ca3Ti2O7 though the detailed study has not been completed. It was concluded that calcium titanate was soluble in molten CaCl2 above 1373 K, and that the CaCl2 bath containing calcium titanate could be applied to Ti electrolysis. A two-step thermochemical reduction was developed to remove oxygen from commercial titanium dioxide, TiO2, producing metallic titanium powder. The first step was to remove >95% of the oxygen by Mg reduction in a hydrogen atmosphere, followed by a de-oxygenation step. The goal is to produce Ti powder that meets the standard specifications for titanium. Several ancillary steps including granulation and heat treatment were introduced to modify the powder morphology, particle size and powder density to make the powder suitable for a range of applications. Detailed compositional analysis indicated that the final product meets the ASTM B299 for general-purpose titanium sponge. The powder can be irregularly shaped or spherical with different granulation treatments. We report a novel process to produce metallic titanium from titanium dioxide—the raw material typically used in the conventional production of titanium metal—via a titanium nitride (TiN) intermediate. TiN is more easily reacted than titanium oxides such as titanium monoxide and titanium dioxide, and shows thermodynamic reactivity equivalent to titanium tetrachloride (TiCl4), which is used industrially as an intermediate in the conventional metallic titanium manufacturing process. The thermal decomposition temperature of TiN (～3500 K), determined from a thermodynamic database, is also significantly lower than those of the oxides (～5300 K) and TiCl4 (～6200 K); thus, it is suitable for use in the available temperature range of an electric arc furnace (～4000 K). Here, we demonstrate the use of TiN as an intermediate for the manufacture of metallic titanium by thermolysis using the arc melting method. In this study, we reduce TiS2 to Ti via both calciothermic reduction and electrolysis in a CaCl2 melt. Upon calcium reduction at 1133 K in CaCl2 melt, the concentration of sulfur decreases to 0.03 mass% S when an amount greater than twice the stoichiometric calcium amount is added. Upon electrolysis reduction at 1173 K in CaCl2-CaS melt, the concentration of sulfur initially decreases significantly to 0.01 mass% S when a sufficiently large amount of electric charge is supplied. Our results indicate that it is possible to achieve sulfur removal via both calciothermic reduction and electrochemical reaction. Metallic vanadium was successfully produced starting from vanadium sulfide by applying electrolysis in molten CaCl2. Vanadium sulfide filled in a cathodic Ti basket and a graphite anode were immersed in the melt of CaCl2-CaS at 1173 K in Ar, and the electrolysis was conducted at a cell voltage of 3.0 V. Sulfide electrolysis did not form carbon deposit and was free from carbon contamination, while carbon powder was formed on the cathode in the oxide electrolysis using the melt of CaCl2-CaO. When the CaS content in the molten CaCl2 increased, electrolysis current increased resulting in fast smelting while the oxygen and sulfur contents in metallic vanadium increased. Oxygen and sulfur contents as low as 3390 ppm and 210 ppm, respectively, were achieved by supplying about four times more electrical charge than stoichiometry. The electrochemical and chemical behaviors of titanium were examined in aluminum chloride-1-butyl-3-methylimidazolium chloride (AlCl3-BMIC) ionic liquid. The reduction of Ti(IV) in AlCl3-BMIC occurs in three consecutive steps: Ti(IV) → Ti(III) → Ti(II) → Ti, and Ti(III) ion can quickly react with Cl− anion to form sparingly soluble TiCl3. However, No elemental titanium can be obtained in either acidic or basic AlCl3-BMIC melt. Metal titanium can be oxidized to Ti(II) by Ti(IV) in AlCl3-BMIC melt. In addition, the anodic oxidation rate of titanium obviously increases in the presence of Ti(IV) and Ti(III) ions, suggesting that the anodic dissolution of titanium involves chemical dissolution. These results indicate that it is difficult to nucleate or stabilize pure titanium in ionic liquid, which makes pure titanium deposition quite difficult. In order to systematically characterize the effects of ion doping on Li4Ti5O12 (LTO) through the molten salt method, different metallic compounds with varying ionic radii doped into LTO were investigated. The results show that doped ions (Al3+, Ni2+, Fe2+, Fe3+ and F−) with similar ionic radius as Li+, Ti4+ or O2− ions can enter into LTO, which leads to smaller particle size than pure LTO, therefore, increasing the specific surface area and shortening Li+ transfer path of LTO. However, La3+ with a much larger ionic radius cannot enter into LTO. Ion doping can enhance the intrinsic conductivity of LTO, thus improving the electrochemical performance of LTO. As the ionic radii of Fe2+ and Fe3+ are the closest to those of Li+ and Ti4+, Fe3O4 doped LTO exhibits the best electrochemical performance, an excellent first discharge capacity of 269.3 mAh·g−1 at the 0.15 C, good high-rate capability (123.4 mAh·g−1 at 10 C); even after 300 discharge/charge cycles, the discharge capacity is 141.1 mAh·g−1, gives an excellent cycle performance with 12.4% loss of capacity at 1 C rate. Due to these factors, Fe3O4 is the most suitable metallic compound doped in LTO via molten salt method. A new method of electrodeposition of Ti using a water-soluble KF–KCl molten salt electrolyte has been proposed. The electrochemical behaviors of Ti(III) ions in a KF–KCl molten salt to which 0.1 mol% K2TiF6 and an excess amount of sponge Ti were added have been investigated by cyclic voltammetry at 923 K. Anodic currents corresponding to the oxidation of Ti(III) ions were observed from 1.5 V (vs. K+/K) at a glass-like carbon rod electrode. In the negative potential region, cathodic currents were seen from 0.3 V, indicating the deposition of Ti metal from Ti(III) ions. When a nickel flag electrode was used, cathodic currents due to the formation of Ti–Ni alloys were observed, in addition to the current of deposition of Ti metal. The analyses of the electrodeposits by scanning electron microscopy, energy dispersive X-ray spectroscopy, and X-ray diffractometry confirmed that dense and smooth films of Ti metal with 20 μm thickness were obtained at current densities of 2.5 × 10−2–1.0 × 10−1 Acm−2. In this paper, the cyclic voltammetry was applied to investigate the electrochemical reduction processes of Nd(III) ions in NdF3-LiF melts with or without excessive metal Nd. Equilibrium experiments were carried out in NdF3-LiF melts with excessive spheric metal Nd to investigate the relationship between the NdF3:LiF mass ratio and NdF2 concentration. Electrolysis experiments were performed in NdF3-LiF-Nd2O3 melts with different NdF3:LiF mass ratios to explore the relationship between the NdF2 concentration and the current efficiency. The results indicated that Nd(III) ions in the melts were reduced in two steps, i.e., Nd(III)→Nd(II) and Nd(II)→Nd(0). NdF2 could be formed by the comproportionation reaction between Nd(III) and Nd(0) and could stably exist in NdF3-LiF melts containing metal Nd(0). NdF2 mass concentration in the melts decreased from 45.5% to 36.4% with the increase of NdF3-LiF mass ratio from 7:3 to 9:1 in NdF3-LiF melts containing excessive spheric metal Nd, which resulted in a higher current efficiency during the electrolysis. And the highest current efficiency of about 50% for Nd extraction has been obtained by electrolysis in NdF3-LiF (9:1 mass ratio) melts with Nd2O3 (2%, mass concentration) at 1423 K.
In the present work, selective extraction of rare earth (RE) metals from NdFeB magnets is investigated by studying the effects of various fluxes, viz. AlF3, ZnF2, FeF3 and Na3AlF6 in the LiF-NdFeB system. The aim is to convert RE from RE magnet into the fluoride salt melt. The results show the complete selective separation of neodymium (also dysprosium) from the magnet and formation of rare earth fluoride, leaving iron and boron unreacted. The formed rare earth fluoride can subsequently be processed in the same reactor through an electrolysis route so that RE can be deposited as a cathode product. 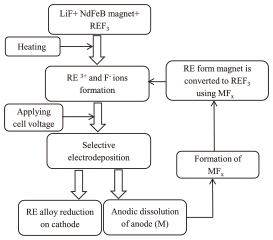 The results of XRD and EPMA analysis of the reacted samples indicate that AlF3, ZnF2 and FeF3 can act as strong fluorinating agents for extraction of rare earth from NdFeB magnet, converting the RE to REF3. The results confirm the feasibility of the rare earth metals recovery from scrap NdFeB magnet as raw material. The fluoride conversion-electrolysis route suggested in the present work enables the extraction of rare earth metals in a single step using the above-mentioned fluxes. A small but significant amount of dissolved titanium is always present in the molten cryolite based electrolyte used during electrowinning of aluminium. The fact that titanium can appear in several oxidation states may be a cause for reduced current efficiency for aluminium, although codepositon of titanium should be thermodynamically favoured. Voltammetric studies were carried out in molten Na3AlF6 - Al2O3 (sat) containing TiO2 at 1020℃. The results suggested that titanium was reduced in two steps from Ti (IV) to Ti (III) followed by reduction of Ti (III) to Ti metal. Experiments were also carried out in industrial aluminium cells. Large quantities of TiO2 were added to the electrolyte during electrolysis, and samples of electrolyte and produced metal were taken and analysed as a function of time after addition. The results suggested that titanium was codeposited at the aluminium cathode by a diffusion controlled reaction. The apparent current efficiency for titanium deposition was estimated to be higher than 90%. The valency problem seems to be less challenging when depositing liquid titanium alloys from molten fluoride electrolytes. This approach may give rise to the development of production of a valuable titanium containing alloy TiAl3. This study demonstrates a new process for physically recovering platinum group metals (PGMs) directly from spent automobile catalysts. Automobile catalysts mostly consist of a honeycomb-structured ceramic substrate coated with a porous catalyst layer supporting fine particles of Pt, Pd, and Rh. In the proposed process, in order to magnetically separate and concentrate the PGMs, ferromagnetic Ni is deposited on the PGM particles (or the catalyst layer) using an electroless plating technique. Experiments were performed using samples that simulated an automobile catalyst. Using the electroless plating process, Ni could be coated on the porous catalyst layer without requiring complicated pretreatments such as sensitization and activation. Furthermore, the PGMs (Pt, Pd, and Rh) could be extracted and concentrated in the form of a magnetic powder through magnetic separation performed after Ni deposition and subsequent pulverization. Thus, the proposed physical concentration process is feasible and effective, and this process can be extended for making the recycling of automobile catalysts more efficient and environmentally friendly. The cooling rate with which the liquid is cooled has tremendous impact on the macroscopic properties of amorphous solids, but little information on the underlying mechanism for this dependence is available, mainly due to the lack of clear characterization on the microstructural variation induced by cooling rate. We built a colloidal glass to obtain its direct three-dimensional configuration by using laser scanning confocal microscopy and investigate the effect of cooling rate on microstructure. By quantifying coordination numbers and bond-angle distribution, we give evidence that the icosahedral-like structure is the most frequent local structure and more favored by the lower cooling rate. The poor plasticity of amorphous metal at room temperature has proved to be one of the biggest obstacles for its widespread application as structural components. In present study, the experimental samples were prepared by suction-casting and high vacuum die-casting with Zr54.6Ti13.8Cu9.3Ni5.8Be13.5Nb3 (at. %) to discuss the effect of the oxygen content and cooling rate on the plasticity of amorphous metal respectively. The results indicate that dendrite with appropriate dimension and fraction can be obtained by adjusting oxygen content so as to improve the plasticity of metallic glasses. Likewise, the appropriate cooling rate even above the critical cooling rate can also be quite effective to make the brittle metallic glasses obtain high plasticity. A theoretical analysis based on the calculation on atomic displacement vectors during twinning was performed to investigate twinning mechanism for magnesium and its alloys. After that, a new mode on the atomic motion during twinning was proposed for magnesium and its alloys. During twinning, it was suggested that atomic motion can be accomplished by two steps from a geometrical view: a pre-rotation of quadrangular prism-shaped atomic group units and a subsequent shear. Through this model, atomic motion during twinning in magnesium can be describe using uniform law. It provide a new view for us to explore the twinning mechanism for HCP metals. But it should be pointed out that the two-step motion law in this paper is just an artificial division. In realistic deformation twinning in magnesium, it is possible the rotation and shear happen simultaneously. Surface morphology obtained using micro electrical discharge machining (micro EDM) not only provides important information, such as wear and lubrication properties, but also shows many micro peaks and craters, which are very different from that machined using traditional methods. Hence, surface morphology evaluations in micro EDM processes using traditional evaluation parameters are not appropriate. In this study, a novel evaluation method, which includes a wavelet filter and the fractal theory, was proposed and analyzed in detail to evaluate the surface morphology in order to achieve the required precision and concision. First, a novel evaluation method was proposed, and the effectiveness of the method was investigated. Second, a series of relevant experiments based on titanium alloys and high-speed steels were conducted to validate the effectiveness of the new method, the analysis results were presented. Third, the fractal trend in the surface morphology was summarized based on the titanium alloy and high-speed steel materials; the rules governing the relationship between the fractal dimension and the surface morphology were proposed. Finally, the phenomena observed in the analysis process were investigated and discussed in detail. Localized over dark current of a hydrogenated amorphous silicon (a-Si:H) layer deposited on p-type crystalline silicon with a pyramidal texture was measured by conductive atomic force microscope. The current followed the ridge lines of the pyramidal a-Si:H texture, and a large over dark current corresponded to a low open circuit voltage (Voc). The current path has two possible phenomena: variable film thickness, local crystallization, and a-Si:H degradation. By modifying the textural structure, the current path of the a-Si:H layer deposited on crystalline silicon with a pyramidal texture can be reduced; thereby the possibility of preserving the Voc of hetero-junction with intrinsic thin layer solar cells could be suggested. A 2-layer Titanium/polycarbonate (Ti/PC) laminated sheet treated by homogeneous low energy electron beam irradiation (HLEBI) to only the PC side prior to assembly and hot press at 438 K for 3.0 min under 20 MPa without the use of fasteners, rivets or glue was investigated. Experimental results showed the 0.30 MGy HLEBI dose appeared to be at or near the optimum, achieving mean adhesive force of peeling resistance, oFp at high accumulative probability of peeling Pp = 0.94 of 141.4 Nm−1 compared to 20.0 Nm−1 for the untreated (without HLEBI). Notably, the 0.30 MGy HLEBI raised the oFp at high- Pp of 0.94 significantly, 706%. Moreover, based on the 3-parameter Weibull equation, the 0.30 MGy-HLEBI apparently enhanced the statistically lowest oFp (Fs) from 0 N·m−1 for the untreated to 15.1 N·m−1 for the 0.30 MGy samples, as well as at low-Pp of 0.06 (the lowest experimental oFp) from 0 for the untreated to 25.5 N·m−1 for the 0.30 MGy samples. Based on the results of XPS (X-ray photoelectron spectroscopy) analysis, chemical bonds occurred. When HLEBI cut the chemical bonds and generated active terminated atoms with dangling bonds at PC surface, they probably induced chemical bonding with the Ti. Furthermore, the HLEBI to only the PC side acted to generate the PC activating strong adhesion to the Ti making the interface stronger than the internal cohesion of the PC itself. In addition, 0.30 MGy-HLEBI apparently increased the active bonds sites of C-O and C-C and then decreased the inactive bonds sites of OH on the PC and Ti, resulting in strengthening the peeling resistance. Therefore, increasing adhesion force between the laminated sheets could be explained. This research investigated the changing morphology of silicon (Si)-supported titanium dioxide (TiO2) thin films with different heating rates and molecular weights (MW) of the added polyethylene glycol (PEG). 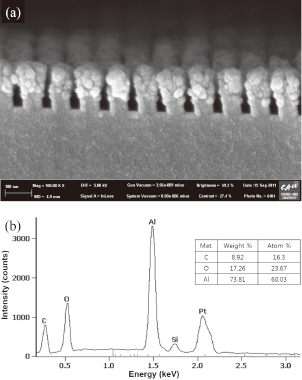 The TiO2 films were deposited on a Si wafer (100) by sol-gel spin coating with PEG (MW = 6,000 or 35,000 g·mol−1) as pore generating agents. Calcination at 450℃ completely decomposed all the organic residues in the TiO2 sol, and the resultant films were in the anatase phase. The combustion nature of PEG was found to be the main factor controlling the film&apos;s morphology, where the exothermic heat of PEG combustion tended to be higher with increased heating rates and dependent on the type of PEG (extended and folded chain crystal). At heating rates of 10℃·min−1 or higher, the exothermic heat led to localized grain coalescence in the TiO2 films, which decreased the film porosity. However, this exothermic heat also simultaneously induced pore agglomeration. Hence, the average pore size of PEG-containing films were larger than in films without PEG. In contrast, the heating rate did not significantly affect the morphology films without PEG. The directional solidification characteristics and generation patterns of isolated pools of liquid metal in plate castings with as cast holes were numerically examined, and fundamental concepts for the casting design, including the holes, were also investigated. For the as cast hole effects H/T (H: as cast hole effective range, T: plate thickness), there were differences depending on the hole size as well as the casting and mold materials, which reflect the directional solidification characteristics associated with the cooling effects due to the hole. For the finite-width plate castings with as cast holes, isolated liquid pools occurred at locations between a hole and an end face or between the holes under specific conditions. The generation status of isolated liquid pools indicated that the conditions with larger values of the difference between the end and as cast hole effects (E−H)/T (E: end-effective range) in the range of 1.8–5.3 are preferable for preventing the generation of isolated liquid pools. Therefore, the consideration of (E−H)/T is useful for the casting design. In addition, the generation of isolated liquid pools could be prevented by the appropriate use of chills. Moreover, the generation was sometimes prevented by a temperature decrease of the melt during mold filling. The success of these techniques in preventing shrinkage defects was experimentally confirmed. MPS (Moving particle semi-implicit) method is one of the popular particle methods. It is well known that calculation instability occurs especially for a slow fluid flow analysis, and the instability appears as unnatural pressure and velocity oscillation. This is because the MPS method adopts predictor-corrector method, and tentative position of particles are not corrected enough at the corrector phase. Therefore an improved multiple relaxation method is proposed in this study to improve the calculation stability. Pressure and velocity correction is conducted multiply in the correction phase, and also adjusting coefficient is adopted in the source term in the Poisson equation for the pressure. As a result, the proposed method improved the pressure and velocity distribution instability. The method was applied to complex shaped casting with a shoulder. The conventional method showed unnatural high pressure and the fluid hopped, whereas smooth and natural pressure field could be obtained using the proposed method. This Paper was Originally Published in Japanese in J. JFS. 87 (2015) 702–708. This paper presents an advanced control system for tilting-ladle-type automatic pouring machines used in the metal casting industry. In order to pour liquid from the lowest possible position, an approach for motion trajectory generation of pouring ladle is proposed in this paper. The proposed approach controls the falling position of outflow liquid and avoids collision between ladle and obstacles. This approach defined three pouring modes derived from the positional relation between ladle and obstacles. Pouring mode switching was also proposed to shift to the lowest pouring mode depending on pouring conditions and ladle posture. An analytical algorithm of the falling position control system was built. The effectiveness of the proposed control system was validated through experiments using a laboratory automatic pouring machine with a monitoring system. This Paper was Originally Published in Japanese in J. JFS 88 (2016) 27–36. We report a simple and cost-effective fabrication method for a wire grid polarizer. The wire grid polarizer was fabricated by incorporating UV nanoimprinting and glancing angle deposition processes. A silicon pattern with a 40 nm line width, 100 nm pitch, and 100 nm height was fabricated by electron beam (E-beam) lithography and reactive ion etching processes. The UV nanoimprinting process was performed on a glass substrate and aluminum nanowires, with a height of 70 nm, were subsequently generated with a glancing angle deposition process. P-polarization transmittance above 55% and an extinction ratio of 31.1～6.1 were measured in the visible wavelength range. Experimental viscosity measurements (50 to 100 Pas at mold walls, T = 273 to 373 K) of an injection-molded highly-filled glass fiber reinforced polyester bulk molding compound (GFRP-BMC) whose fiber length (lfiber = 0.44 mm) was optimized for tensile mechanical strength agreed well with that previously calculated by Navier-Stokes equation from fiber orientation mapping. The mapping was from 0.44 mm fiber formulation molded sample exhibiting ～60, ～40 and 20% higher tensile strength, strain, and modulus, respectively than commercially used (lfiber = 6.4 mm). Based on the viscosity measurements a new “mold filling” model is constructed with physical meaning to predict needed injection molding parameters pressure (dP), shot time (ts) and shot weight (ms) for various size dog-bone specimens varying length (Ltot), gauge length (LB), width (w) and thickness (th) for the optimized formulation. Moreover, the Mooney-Rabinowitsch calculation is found to be a decent predictor for shear rates across specimen thickness and at mold walls measured from the mapping. This was without buying new equipment, using the existing injection molding machine to save cost. Nano-sized cerium dioxides (CeO2) are prepared by the hydrothermal method, using nitric cerium. The XRD study shows that nano-sized CeO2 has an appreciable amount of cubic phase. The nano-sized CeO2 obtained has an average particle size in the range of 4.5–10.3 nm. TEM micrographs show well-dispersed spherical-like and cubic-like CeO2 nanoparticles. The UV–DRS absorption spectrum for alkali-treated CeO2 shows an absorption peak at 365～384 nm. We developed an original liquid phase epitaxy technique that uses Ga-Al solution to grow AlN on surface nitrided sapphire substrates. In this paper, effects of temperature, solution composition, and N2 gas flow rate on the growth of AlN layer were investigated. The AlN layer grown in the solution with higher Al content and higher growth temperature tended to dissolve into the solution, thus, the AlN layers exhibited inhomogeneous surface. The growth rate had a maximum at 60 mol%Al and at 1673 K for solution composition dependence and growth temperature dependence, respectively. On the other hand, the growth rate monotonically increased with increasing N2 gas flow rate. Based on these results, growth mechanism and rate-determined step of this liquid phase epitaxy process were discussed. The in-plane and cross-plane transport properties of nanocrystalline bismuth telluride (Bi2Te3) thin films were evaluated to analyze their anisotropic behavior. Bi2Te3 thin films were prepared via radio frequency (RF) magnetron sputtering, followed by a subsequent treatment of thermal annealing and homogeneous electron beam (EB) irradiation at various EB doses. The crystallographic properties of the thin films were determined by X-ray diffraction (XRD) analysis. It was determined that the crystal orientation (Lotgering factor; F value) of Bi2Te3 thin films can be controlled by homogeneous EB irradiation treatments, without resulting in crystal growth. The electrical conductivity and Seebeck coefficient were measured in the in-plane direction of the films, and the thermal conductivity was measured in the cross-plane direction using the 3ω method. The anisotropic analysis was performed by combining the F value of the thin films with a simple model based on the transport properties of the basal and lateral planes of single- and poly-crystal Bi2Te3. The electrical and thermal conductivities of the in-plane and cross-plane directions of the EB-irradiated thin films clearly differed; however, there was no significant difference between the Seebeck coefficient values of the two planes. Finally, we determined that the figure of merit, ZT, was enhanced by the homogeneous EB irradiation treatment, and the in-plane ZT value was 25% greater than that of the cross-plane direction. Enhancement of surface properties such as wear resistance of Zr-based bulk metallic glasses (BMGs) is important for many applications of the materials. In this paper, the effect of thermal oxidation on the tribological behavior of a Zr-Ti-Cu-Al-Y BMG was studied. It is found that oxidation treatment greatly improves the wear resistance of the BMG, which is ascribed to the formation of a layer of oxidized scale. This result is beneficial for the improvement of surface properties and further application of the Zr-based BMGs.